Whole Wheat Sweet Potato Pancakes with Spiced Apple Compote: Tender, whole wheat, sweet potato pancakes are topped with a spiced apple compote–a great way to start any day! The first weekend of fall calls for a special breakfast. Sweet Potato Pancakes with Spiced Apple Compote happens to be the PERFECT fall breakfast recipe. Reminiscence of fall and cooler temperatures? Check! As you know, I LOVE sweet potato recipes. I eat them in savory dishes, sweet dishes, for breakfast, lunch, dinner, and dessert. You add the warming spices of cinnamon, ginger, and nutmeg to apples simmering in pure maple syrup–well, I am beyond ready to toss the googles into storage and break out my sweaters and boots. Since sweaters were not an option in the 90 degree weather, I would opt to pretend it was fall. Easy to do when you take a bite of these pancakes. Mix together dry ingredients in large mixing bowl. Combine dry and wet ingredients, together being careful to not over-mix. Heat large griddle or nonstick skillet over medium-high heat. Scoop pancake batter by 1/4 cup measurements onto heated griddle. Cook until bubbles appear on surface of pancakes and flip and cook an additional minute or two. Maple syrup is delicious on sweet potato pancakes, but simmered spiced apples takes these pancakes to a whole new level of deliciousness. Bring apples, cider, spices and maple syrup to a boil. Reduce to a simmer and cover. Allow to simmer until apples are tender, about 25 minutes while making and cooking the pancakes. Feel free to substitute the cooked, mashed sweet potato with canned pumpkin. You may need to cut back on the liquid just a bit, as canned pumpkin tends to be moister then cooked sweet potato. Yes, they will be Pumpkin Pancakes, but still just as yummy. Use Instant Pot Sweet Potatoes to easily make sweet potato puree. Apple Cider adds so much flavor to both the compote but feel free to omit and just use water. Even apple juice works in this spiced apples. I use whole wheat pancakes in the batter. You can use all-purpose or 1:1 Gluten Free Flour–both work and I have made the gluten free whole wheat sweet potato pancakes with success. Buttermilk is my go-to when making pancakes if I have it. If you don’t happen to have buttermilk, add 1 teaspoon lemon juice or white vinegar to milk and let sit for 5 minutes. It will work! If you want to keep these dairy-free, use almond milk or apple juice in batter. If you don’t have butter, or want to make these Dairy-Free Sweet Potato Pancakes, I recommend using melted coconut oil. Canola oil will work as well. Have extra? Freeze for future use. Just lay out the pancakes in one layer on a cookie sheet and freeze for 30 minutes. Then remove and and place in freezer safe bag or container. Then pop one or more out of the bag at a time and reheat for 2 minutes and serve. 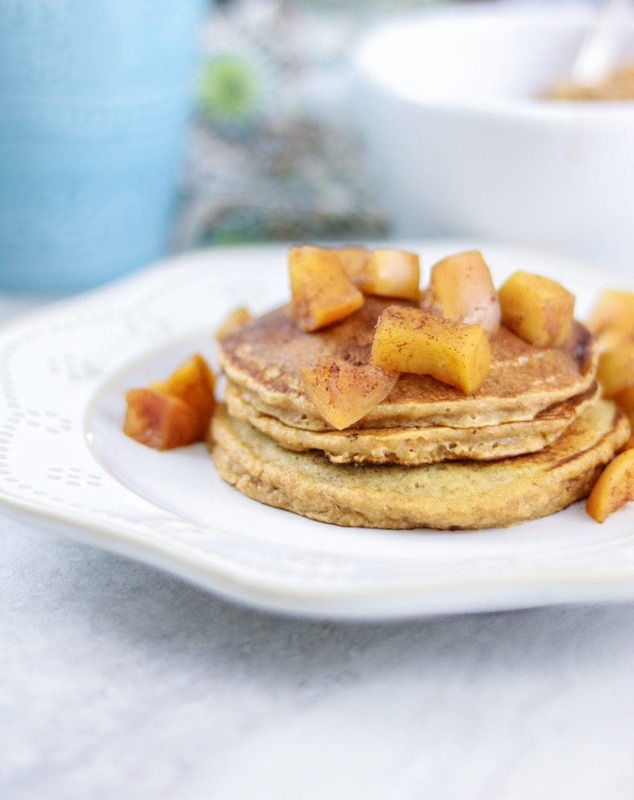 Easy whole wheat sweet potato pancakes that are topped with cinnamon apples. Bring all ingredients to a boil. Reduce to a simmer and cover. Allow to simmer until apples are tender, about 25 minutes while making and cooking the pancakes. Mix together the flour, baking powder, salt, cinnamon, and nutmeg in a large bowl. Set aside. Whisk together the milk, eggs, vanilla, maple syrup, and melted butter. Stir into dry ingredients until just combined. Set aside the batter, while you heat a greased or non-stick skillet to medium heat. Scoop 1/2 cup batter onto griddle for each pancake. Flip when bubble start to appear, about 5 minutes. Flip and cook for another 3-4 minutes. I use whole wheat pancakes in the batter. You can use all-purpose or 1:1 Gluten Free Flour--both work and I have made the gluten free whole wheat sweet potato pancakes with success. Buttermilk is my go-to when making pancakes if I have it. If you don't happen to have buttermilk, add 1 teaspoon lemon juice or white vinegar to milk and let sit for 5 minutes. It will work! If you don't have butter, or want to make these Dairy-Free Sweet Potato Pancakes, I recommend using melted coconut oil. Canola oil will work as well. Oh wow, I know what we’re having for breakfast tomorrow! Your family will love them Jennifer! That is one stack of perfection and the apple compote? To be eaten on it’s own! You could totally devour that apple compote without the pancakes. Gorgeous pancakes Kristen and I love the apple compote! Bring on fall!!!! I would love waking up to a stack of these pancakes! They are so so good! Those look AMAZING. So fluffy.. I can’t get over it! Oh, wow! Such a great recipe and so original! I love apple compote, I’ll have to try it on your pancakes recipe. Thanks for such a delicious idea. You bet!! That apple compote is the perfect pairing for these pancakes. Congrats on your new home!! I don’t use sweet potato nearly enough. Sounds so good with apple!! Thanks for linking up at #SaucySaturdays. Sweet potato and apple are truly a match made in heaven–so tasty! Thanks so much for visiting Anita 🙂 You will love these pancakes! Sarah–I hope you love them as much as my family does! 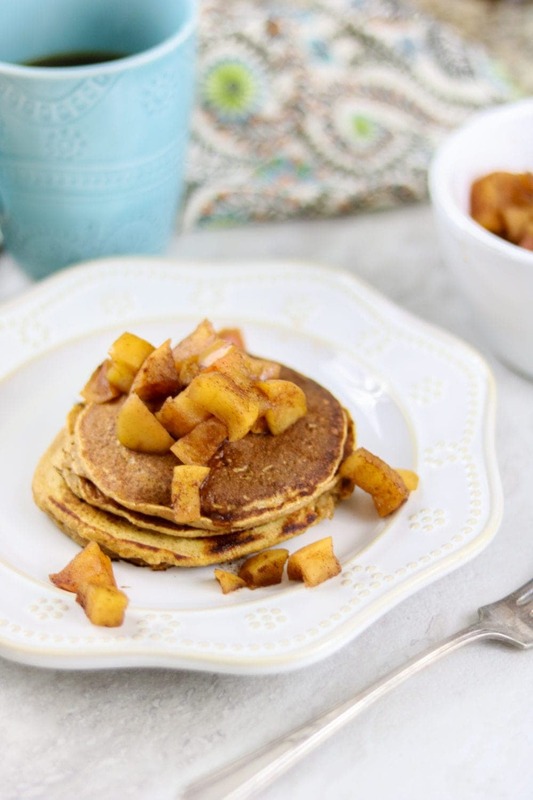 Love sweet potato pancakes and this apple compote sounds amazing! Thanks Maris–the compote takes good pancakes over the top! !